Just call me the cupcake arsonist. This is the second time I've intentionally set fire to this cutesy confection. What's the appeal? Maybe I feel the cupcake could use a break from its curlicued reputation. Or maybe it appeals to my inner juvenile delinquent who loves to play with matches. 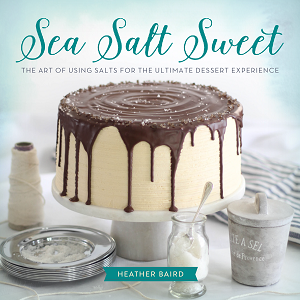 All I know for sure is, this is one incredibly delicious show-stopping dessert! It's a perfect dramatic finale for any dinner party. Baked Alaska is a layered dessert consisting of cake, ice cream and sweet meringue, so it wasn't terribly difficult to translate into cupcake form. 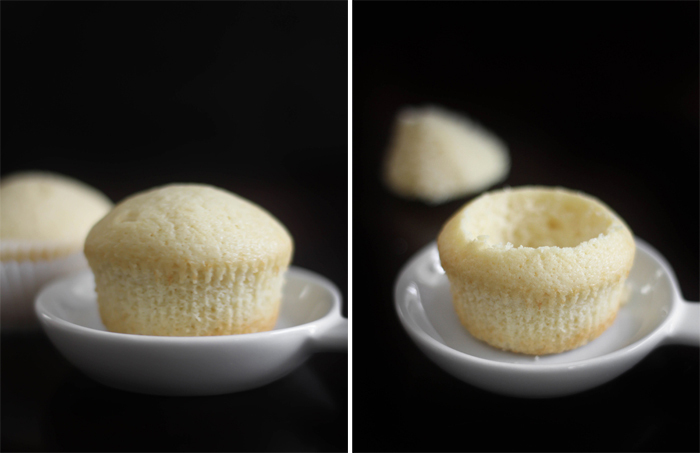 To begin, you'll need a "naked" cupcake - no wrappers! They'd catch fire, and we certainly don't want burning paper on our delicious treat. You have two options to obtain your "naked" cupcakes: 1.) Bake cupcakes without liners in a greased and floured cupcake pan. 2.) For easy clean-up, use your least cutesy cupcake papers and just peel them away before you begin assembling the cakes. I'm all for the latter - one less pan to wash. Inexpensive parchment paper liners will do just fine. 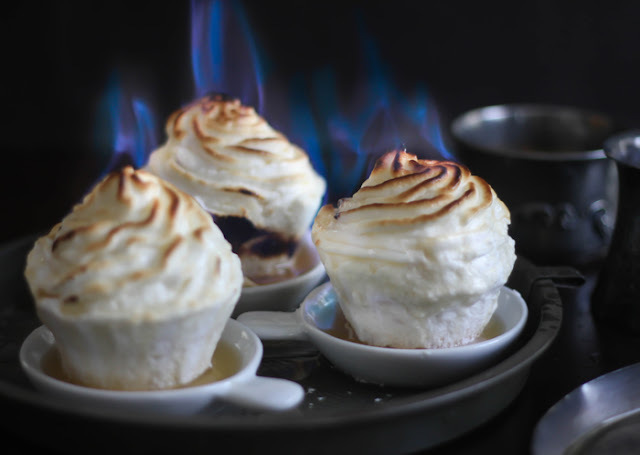 To make the blue-flame magic happen, turn down the lights and sprinkle a couple of tablespoons of warmed brandy over each meringue-coated cupcake. Ignite with a grill lighter or a long fireplace match. Please note that I used a little more brandy on these cupcakes for photography purposes. I needed a longer burn time so I could get a good picture of the flame. (I ate one of these cupcakes after photographing and it was a little strong - made my tongue tingly!). Back when I made Flaming Strawberries on Cupcakes, I didn't know heating the liquor would help it catch fire easier. Try it! It makes all the difference! 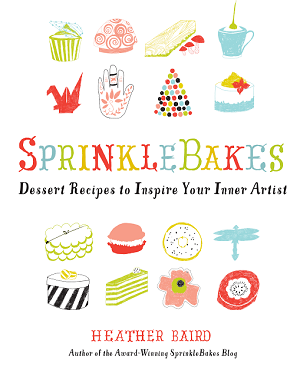 My pal Meaghan of The Decorated Cookie has a new book available called Sugarlicious! I recieved my copy last Thursday, and it is a delight to read! Lots of edible crafty goodness in there. I recommend! Slight freak-out at the realization that in just a few short months, I'll be making a wedding cake that serves 200 people! Jesus take the wheel. 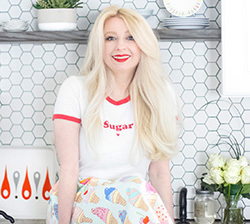 Bon Appetit included me and some of my bloggy pals in their Red Velvet round-up. Check it out here! My fur-baby Churro hurt his paw while playing outside, which resulted in a trip to the pet ER. He's doing better, but gosh - was I ever worried! I really don't know how parents of human children do it. You have my utmost respect! 2. Sift together flour, baking powder, and salt. In a mixing bowl, cream the butter and sugar until lightened in color and fluffy. Add eggs one at a time, mixing well between additions. Beat in vanilla extract. 3. Add flour mixture and milk alternately, beginning and ending with flour. When completely incorporated, divide batter evenly amongst liners, filling them 2/3 full. Bake for 15-20 minutes, but check them after 15. 4. 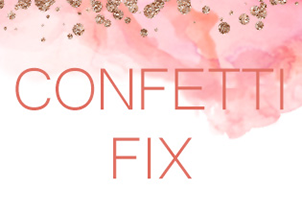 Peel away cupcake liners and discard. Cut a small divot out of the top of each cupcake, large enough to hold about 2 tablespoons of ice cream. Fill each divot with ice cream and place filled cupcakes in the freezer while preparing the meringue. Note: Warm the brandy just before serving the cupcakes. 1. In a large mixing bowl, beat egg whites with an electric mixer until foamy. Add the cream of tartar and beat until soft peaks form. 2. Gradually beat in the sugar until the meringue is stiff and glossy. Transfer half the meringue to a large piping bag fitted with a large star tip. 3. Preheat oven to hottest setting (this is usually broil). 4. Remove the cupcakes from freezer. Set each cupcake on their own small plate, and then set the plates on one or two large baking sheets. Immediately pipe meringue swirl on top of the cupcakes, covering/enveloping the ice cream completely. Use an off-set spatula to coat the lower part of the cupcakes with meringue. 6. When the flames die down, serve immediately. Note: As a safety precaution, keep cupcakes on the metal baking sheet until flame subsides. So awesome, and the perfect use for an animated gif! These are phenomenal! These are so lovely. I am assisting a friend on a wedding cake this summer and am already anxious about it. Love the little moving photo! Those sound amazing! And omg..poor little puppy :( He is darling! Seriously?! A moving photo!! You amaze me constantly, you adorable baking wizard!! Poor puppy baby...I just know you are spoiling him though like a good mommy would!! WOW I love these! You are probably the most creative blogger ever! Those look terrific! You are so creative and talented. Poor Churro... Congrats on being included in BA's roundup. Beautiful pictures - really truly amazing. Great idea too, a mini baked alaska sounds a lot more fun than a big one! WOW!! Hats off to you! Not only for the delicious baked Alaska, but for the awesome photos and the animated fire! Love it! First of all these cupcakes look so tasty! And I love the fire-gif. So snazzy! Whew. I'm glad little Churro is ok. How scary! Wow, I love the idea of flambeing cupcakes! I, too, am freaking out about making a wedding cake. I am making my first one in 2 1/2 weeks to serve about 140 people. So nervous! But I'm sure yours will look and taste great! :) Go get 'em! This is amazing!!! I will have to try this cupcake for a special occasion soon!!!. Hope your puppy feels better. I love that you named your dog Churro! I hope he's feeling better. My friend named his boxer Beef and you're is the only other food named dog I've come across. I think you read my mind because I was just thinking about baked alaska the other day.... but this is so much better! Too Cool for School, Sprinkles!! And...congratulations on the Bon Appetit roundup, I'll have to look for it. Wow, those cupcakes are awesome. These are way too awesome, Heather! I'm always game for desserts on fire. They look great. Get well soon, Churro! I just recently found out what a baked Alaska was and thought I should try it. This smaller version looks so delicious! And I'm down to settings on fire! Love that you set fire to things... you did it with strawberries once too right? Your poor puppy :( I hope the cutie is better soon! Sweet! I've never had baked Alaska but am thoroughly intrigued. Wow, they look amazing! 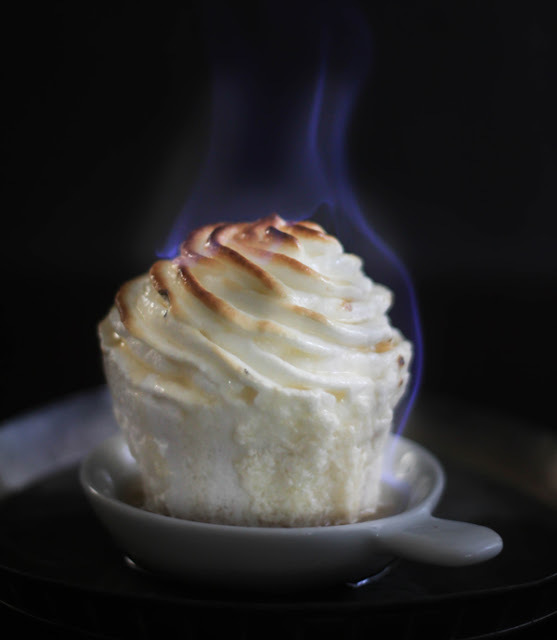 I love Baked Alaska & cupcakes - sounds like a perfect combination! you are truly talented and I cant wait for your book to come out. I do have a question, where did you find those chocolate sticks in the pics? I've searched everywhere for those. Oh, poor fur baby! I hope his paw heels quickly. Your cupcakes look awesome! Dear Cupcake Arsonist: Beautiful job! These looks so magical! And I am so sorry to hear about little Churro. To tell you the truth, I have a son and I've had pets, and although I might sound terrible as a mother saying this: it is sometimes WORSE when an animal is sick or injured because they are so helpless and can't tell you what's wrong and how much they are hurting! I will say a prayer for little Churro. p.s. he looks awfully cute in his little footie cast though! Awww your poor baby!!! I hope everything heals up nicely!! Also, this cupcake recipe rocks my world!! Cool! These flaming cupcakes are so awesome! 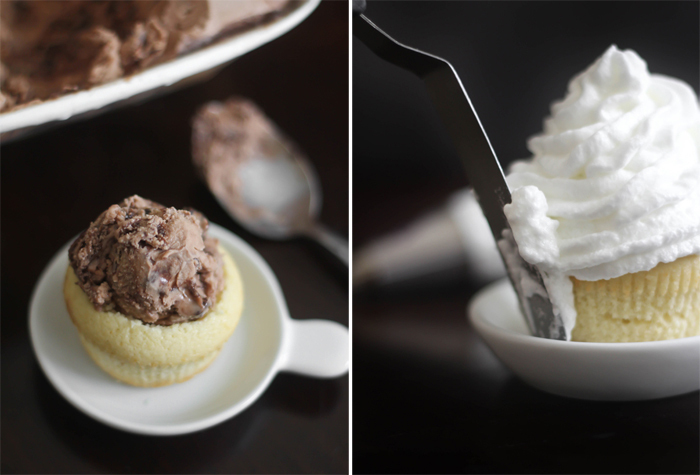 I love that you made ice cream cupcakes into baked alaskas! These are just amazing! Not only do these have a beautiful presentation but I bet they taste absolutely delicious as well! Something I would just love to try. Aww! Poor sweetie. I hope he feels better soon. He is so adorable in that blue cast! Words can not describe the awe that I am in. I thought your flaming strawberries last year were spectacular and this year, you have really outdone yourself! Amazing! Beautiful Cupcakes Heather! I love how it makes the Baked Alaska such a simple dessert. I will most definitely be making these! Could you be any more amazing?! Your cupcakes are amazing but more importantly, your dog with the cast is just too cute. He just might be stealing the cupcakes thunder on this post. Such a spectacular way to finish a dinner party. You are so gosh darn talented. You amaze me. Wow, what a great recipe! Nice pictures. Poor Churro! I hope he feels better soon! Loki tore his compound ligament over the summer, so I feel your pain! WOW! These look fabulous! Super creativity!! Where did you get what I'm assuming are chocolate swizzle-like sticks that are in the pictures????? The cupcake arsonist...that's hilarious!!! Seriously though, these look amazing!!!! Poor Churro, I hope he gets better soon. So, I scrolled right through to the pictures first like I always do when I visit your site and 5 minutes later after reading it as well, my eyes are still bulging in awe. 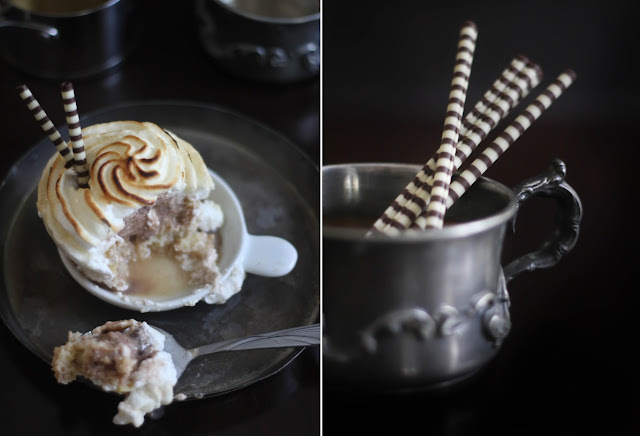 Hot, cold, flaming, torching- this is no ordinary baking blog. I love it! I you don't read the post and just scroll through the pix you might think poor Churro is the cupcake arsonist. Hope he's on the mend soon.And of course I love these dramatic cupcakes. Heather these look amazing and I hope by now, Churro is on the mend! these are unreal! so fun and so cute. I love the idea of turning this old classic into a cupcake! OMG! I love this, I've never seen this anywhere else!! Can't believe I came across this recipe! My sister-in-law is planning on trying a Baked Alaska dessert for an event next week and we were wondering if the meringue can be made a little bit ahead of time, or will it break down? Any thoughts? What a wonderful idea...they look fantastic! And your poor pup, glad he is OK.
Wow these look awesomely impressive, would love to try and make them but I am too scared of fire - I have one of those kitchen torches and it is still in it's packing from about 10 years ago. You are a true talent. Your work is a pleasure to admire and no doubt eat! These look amazing! My parents always talk about baked Alaska and I've never tried it...until now! Looks so gorgeous,I admire your work here. No doubt, something to give a try! I have a strategy I thought might help with your flaming cupcakes. My mother does a flaming pudding every year for the holidays, and to light it she puts some cognac on the cake, and some in a spoon. Then when she holds the spoon over a lighter, she has a flame in the spoon that she can pour over the pudding. I think this is easier than lighting the cake itself: maybe give it a shot? These look delicious. The flaming strawberry ones do as well. The animate blue flame is so cool! Bravo. I can look like a pro with this one. So possibly THE HOTTEST cupcakes on the web! Awhhh, poor pup! 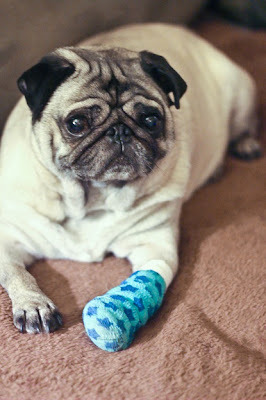 I have a pug too, so immediately had pangs of sorrow when I saw his foot ;( The cupcakes look good too!! Wow! Just wow. And yum. Hi!I have just received the versatile blogger award and as per the rules i am supposed to pass it on to 15 fellow bloggers I liked. I have been a frequent visitor of your blog and really enjoy reading it.I would like to nominate your blog for "The Versatile Blogger Award" for its great content and versatility. First...these baked alaska cupcakes are just incredible! oh you clever little baker you! i LOVE that last moving photo. Going back up to watch that video....now! -I know I need to let the cupcakes cool before adding the ice cream to the middle, can I put them in the fridge to speed up the cooling process or will this dry out the cupcakes too much? -Also, if I do not plan to serve the cupcakes immediately, how can I preserve them and for how long? Do I make the meringue and apply it directly before serving or can this step be done in advance? You can put the cupcakes in the fridge, I would cover them in plastic wrap though, so they don't dry out. As for the serving - you can store the meringue-frosted cakes in the freezer, but I'd take them out and let them warm slightly before flaming them. 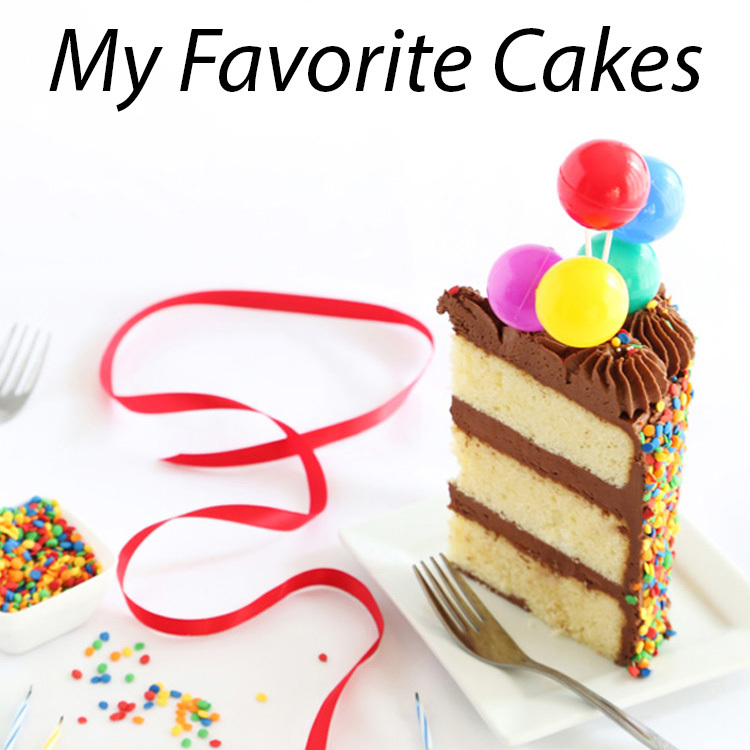 Do you have an air-tight plastic container you could put the cakes in? That would be the best way to maintain them. I would frost them no more than 24 hours in advance. Meringue can get a little funky after a while. I suggest making a few extra and test out your flaming technique. Warm liquor will ignite easier than cold. It took me a couple of tries to find what worked. To begin with,the animated pic is simply fab!! DO these cupcakes have shelf life? Can these be stored for a few days?? I love this! I want to do this for my kids at school, any suggestions of a way to get them to flame without using alcohol?